If you're not familiar with Steve Angarthal, you may know him as the guitarist for Fire Trails, a traditional heavy metal band from his native Italy. Angarthal also pitched his own project a few years back called Dragon's Cave. For the most part, 2010's Elektro Motion, an album of largely guitar-centered melodic hard rock, was his first attempt at a solo project. Now, dropping any disguising moniker, Angarthal returns with another solo, firmly planting his name on the cover of Uranus And Gaia. It may seem a strange title, but Angarthal has a fascination with a cross section of folklore and mythology as well as the Bible and fantasy literature. Press materials suggest, "The album takes the listener on an epic journey through Greek mythology (Sailing At The End Of The World, Uranus And Gaia) and Celtic mythology (Morrigan', Holy Grail), Biblical symbolism (Leviathan Rising and Miles In The Desert), and fantasy literature (Wielders Of Magic and The Abyss Of Death are inspired by the novel The Sword Of Shannara)." As for the music, Angarthal creates a certain hybrid sound, largely classic melodic heavy metal with a little power metal dropped in, and some healthy hard rock groove. 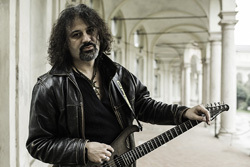 Yet, being the principal composer and player, the album is inherently guitar driven, from the guitar harmony to his impressive fret work, which traverses the range of neo-classical to hard rock guitar. Following that motif, Angarthal offers at least three instrumentals Leviathan Rising, Wielders Of Magic, and Miles In The Desert, where his guitar skills and compositon get a workout. I was partial to that last song as it incorporates some classical acoustic guitar next to the shredding. 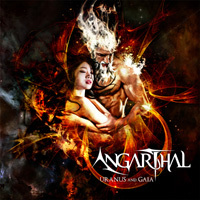 Besides the heavy metal and instrumentals, Angarthal offers two ballads with Unbroken and Losing My Direction. The former turns more on an ascending arrangement, building to a crescendo like an anthem. The latter is more symphonic, yet largely moved by acoustic guitar and Angarthal's vocals. Although within this song, especially in the refrain, he was forcing clear enunciation when he was actually intending dramatic emotion. Nevertheless, Angarthal continues to be an adequate voice for his own music. In the end, while a different direction than his previous solo work, Uranus And Gaia finds composer and guitarist Steve Angarthal in fine form, crafting melodic heavy metal with his impressive guitar work and sound song composition at the forefront.